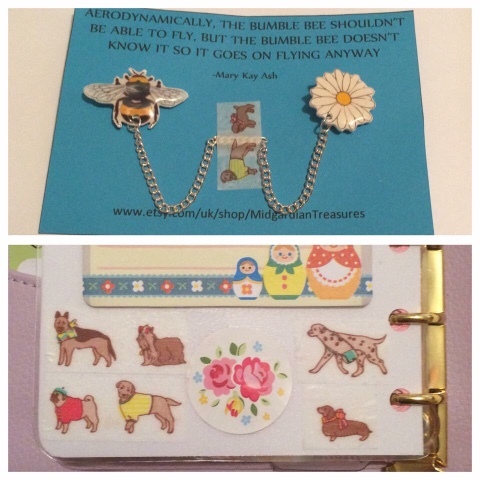 I came across Midgardian Treasures while on the hunt for some collar clips to jazz up my white shirts and found the most beautiful bumble bee and daisy ones on Ellie's shop. 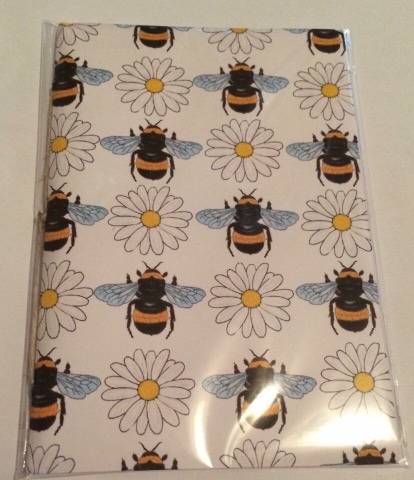 I knew that I had to have them so I went ahead and ordered them along with a little bumble bee printed notebook as I go through notepads so quickly and always want them to be cute. My order came packaged in tissue paper and the cutest washi tape decorated with little dressed up doggies on it. You guys know how I reuse washi and stickers so these doggies went straight into my planner as you can see. The clips themselves have a butterfly brooch backing which is nice and easy. On the card, there's a cute little quotation about bumble bees which made me grin for a good couple of minutes. The bee and the daisy are made from glazed shrink plastic I believe and the colours are lovely on them. I'm really pleased with these - they will look lovely attached to my white shirt for work. The notepad is beautiful as well, nice and small so it will fit in my handbag for work as I like to take a small bag. It's really lightweight but still substantial as the paper is nice and thick. I love the touch that the hemp string adds on the spine. This is such a lovely notebook, it has a vintage vibe about it while still being cute. Definitely check out Ellie's shop here!